I was reporting it previously, the deforestation of the world’s largest forest decreased last year. But it seems that it increased again in 2008, and this albeit the Brazilan government’s ambitious goals. Even if this is a small increase compared to last year – less than 4 percent – this is still a big problem as no less than 11,968 square kilometers of forests were destroyed in a single year. According to the WWF, deforestation and forest fires are responsible for 75% of Brazilian greenhouse gases emissions. It is time to act on that topic. Deforestation in Brazil’s Amazon forests has flipped from a decreasing to an increasing trend, according to new annual figures released yesterday by the country’s space agency INPE. Commenting on the figures, Brazilian environment minister Carlos Minc confirmed that the government will on Monday announce forest related carbon emission reduction targets, which will link halting deforestation to the national climate change campaign. 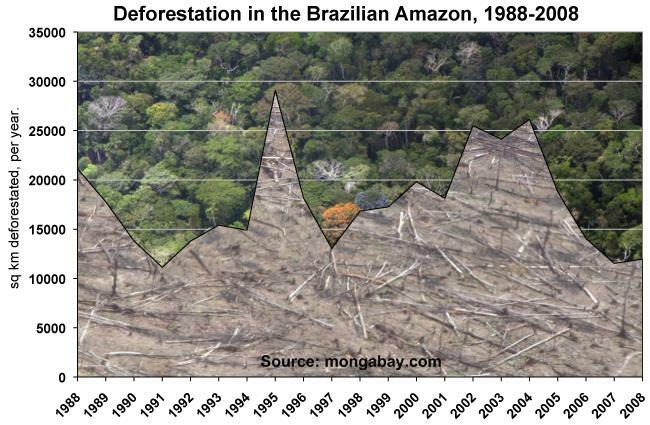 From August 2007 to July 2008, Brazil deforested 11,968 square kilometers of forests in the area designated as the Legal Amazon, a 3.8 per cent increase over the previous year and an unwelcome surprise following declines of 18 per cent over the previous period. From 2003-2004 to 2006-2007, annual deforestation totals from the agency fell from 27,423 km2 to 11,532 km2. There were fears that the current trend could have been worse but for new measures introduced part way through the year when it became apparent that annual deforestation was accelerating towards a possible 15,000 hectare level. Between May 2000 and August 2006, Brazil lost nearly 150,000 square kilometers of forest-an area larger than Greece-and since 1970, over 600,000 square kilometers (232,000 square miles) of Amazon rainforest have been destroyed. (…) In many tropical countries, the majority of deforestation results from the actions of poor subsistence cultivators. However, in Brazil only about one-third of recent deforestation can be linked to “shifted” cultivators. Historically a large portion of deforestation in Brazil can be attributed to land clearing for pastureland by commercial and speculative interests, misguided government policies, inappropriate World Bank projects, and commercial exploitation of forest resources. For effective action it is imperative that these issues be addressed. Focusing solely on the promotion of sustainable use by local people would neglect the most important forces behind deforestation in Brazil. Brazilian deforestation is strongly correlated to the economic health of the country: the decline in deforestation from 1988-1991 nicely matched the economic slowdown during the same period, while the rocketing rate of deforestation from 1993-1998 paralleled Brazil’s period of rapid economic growth. (…) A relatively small percentage of large landowners clear vast sections of the Amazon for cattle pastureland. Large tracts of forest are cleared and sometimes planted with African savanna grasses for cattle feeding. To read out more on this most interesting article, please read out their full page.